I have been a huge Sunset magazine fan for years now and am SO excited they moved their headquarters to Oakland--yay for the east bay! I was even more excited that I got to get a first look at their new digs at 55 Harrison Street in Jack London Square. I don't think these photos do it justice--I was completely floored by the new office space. 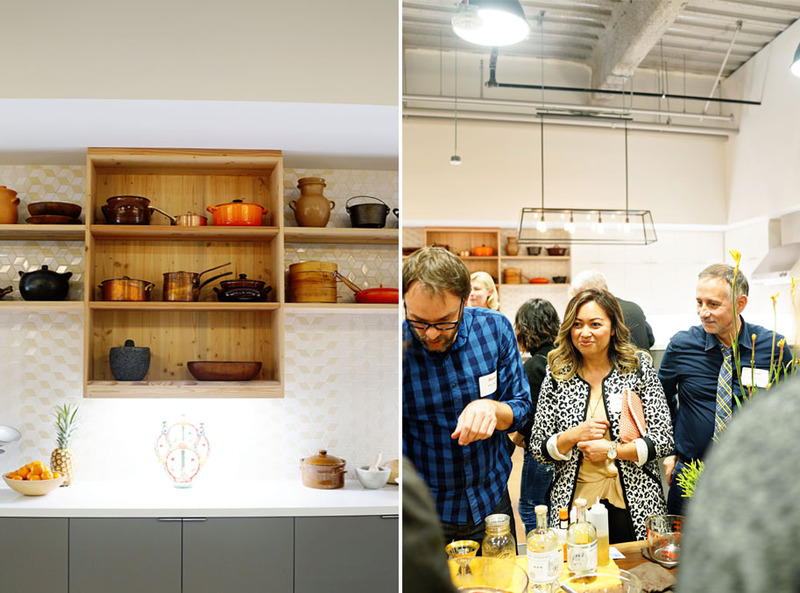 From the beautifully designed test kitchen (think Heath Ceramics tiles, open space, cork flooring and clean lines) to the all-glass, floor-to-ceiling wine "cellar", there was no detail left untouched. I also loved that they kept some of the artwork and iconic pieces of furniture from the old headquarters. After more than 50 years in the iconic Cliff May-designed headquarters in Menlo Park, Sunset moved to Jack London Square in Oakland, a vibrant neighborhood full of small businesses and awesome restaurants, coffee spots, and of course, Miette (my fave!). The new offices were designed by San Francisco architects RMW. Side note: Our Cliff May-designed home is the only one in Berkeley. We were featured in the January 2011 issue of Sunset Magazine--Lucas was so tiny then! One of my favorite parts of the office is this floor to ceiling library housing stacks of Sunset magazine archives, cookbooks, pieces from the old headquarters, and even a little reading nook seamlessly built right in. I could look at this space all day. And that painting! Below is Margo True (right), Sunset's Food Editor (love her recipes!) with Carol Shih (left), Digital Associate Editor. And check out Sunset's original test kitchen on the cover the November 1966 issue! Here's Oakland's Mayor, Libby Schaaf, on one of the office tours. Below to the right is Sunset's Editor-in-Chief, Irene Edwards. I really loved meeting her--she was so down-to-earth, vibrant and full of positive energy. I'm allergic to alcohol but this floor-to-ceiling glass wall wine cellar was so dreamy. More books! And that wooden slat wall--LOVE! Reminds me of a George Nelson platform bench. I'm also excited to visit Sunset's main test garden beds and outdoor kitchen at Cornerstone, a public garden, event and retail space in Sonoma. Below is Johanna Silver, Sunset's test garden guru. What a rad job! One of the highlights of the night was guest chef Tanya Holland, Executive Chef and Owner of Brown Sugar Kitchen and B-Side BBQ in Oakland, CA. She demonstrated a quick version of her technique for flavorful fried chicken and served it up with a bright and zingy black eyed pea salad and buttermilk biscuits. Yum! For dessert were these delicious little Mini S'mores made by one of my favorite bakeries Miette. Nine of them count as one normal sized one, right? This is the other kitchen where some photo shoots and guest chef demonstrations take place. The all white dishes and accessories along with the copper Kitchen-Aid mixer (LOVE) were generously provided by Williams-Sonoma. Sprinkled throughout the office were these gorgeous arrangements by Berkeley's Flowerland (signs were printed by my friend Rori at Paper Monkey Press). These addictive Candied Rosemary Hazelnuts were a sneak peak from Camp Sunset, A Modern Camper's Guide to the Great Outdoors (Oxmoor House, May, 2016). The recipe is from chef-owner Jason French of the Portland restaurant Ned Ludd. I'm totally going to make these! I mean, look at their view! Thanks for the awesome housewarming invitation. Welcome to the east bay, Sunset! Check out more photos on Instagram #TheNewSunset. The Sunset Celebration Weekend is coming up on May 14th and 15th at Cornerstone in Sonoma Wine Country which will include the debut of the new Sunset Test Gardens and Outdoor Kitchen and will reflect the sophisticated lifestyle and taste of Sunset’s gorgeous new Sonoma Wine Country location.